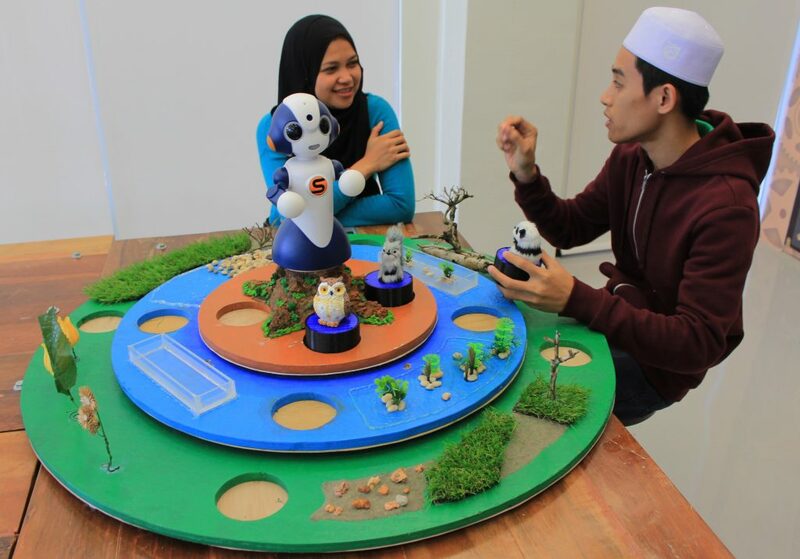 Project In-Visible Island is playful multi-sensory storytelling device capable of supporting AI machine storytelling and collaboration between visually impaired children as well as with children with no visual disabilities. Within this project, we are trying to use technology as a tools in bridging the gap between the able bodied and those that required special assistance in everyday lives. Technology is often characterized as liberating – making up for social, educational, and physical barriers to full participation in society. Multi-sensory interaction, which accommodates different cognitive and perceptive needs, are beneficial for collaboration and inclusion. Researcher found that there is connection between audio and tactile aesthetic quality that encourage social and cultural inclusions also by incorporating smell as part of multisensory experiences it can reinforce user’s experience of credibility, pleasurability and provides directional properties. Our intention is to explore field we call Mixed Experiential Reality as we believe we should move further from technology-based to experience-based environments and make them sharable. 4) Braille movable Display Reader to display and share the stories among the players. In-Visible Island is equally exposed to everybody but in different realities, with capacity to make a bridge between visionless and visible reality and make those experiences sharable. Either technology promises to liberate us from the confines of embodiment and provide us with a futuristic antidote for impairment, most of the technology used for disable now highlighted the dissimilarities instead of connecting the two worlds together. Mix Experiential Reality we are trying to create is reality which everybody can experience and share together such as in case of In-Visible Island project where both sighted and visually impaired children able to enjoy the storytelling together. MMU Cyberjaya Visited Imagineering Institute.